Extremely durable and designed with safety in mind, this unit is perfect for training athletes of all sports. 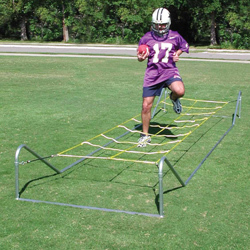 Features an optic yellow step grid (adjusts from 6" to 15" height) and an exclusive frame design to keep all tubing safely away from the training path. Frame Constructed with powder-coated 17 gauge tubing. No tools required to dis-assemble. Grid is 14' 10" x 3' 3".